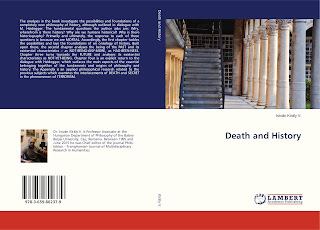 NEW WAYS TO UNDERSTAND OUR HISTORY, MORTALITY and the TERRORISM ! The analyses in the book investigate the possibilities and foundations of a completely new philosophy of history, although outlined in dialogue with M. Heidegger. The fundamental questions the author asks are: Why, wherefrom is there history? Why are we humans historical? Why is there historiography? Primarily and ultimately, the response to each of these questions is: because we are MORTAL. Accordingly, the first chapter tackles the possibilities and lays the foundations of an ontology of history. Built upon these, the second chapter analyses the being of the PAST and its existential characteristics – as NOT-BEING-ANY-MORE, as HAD-BEEN-NESS. Chapter three turns towards the FUTURE and analyses its existential characteristics as NOT-YET-BEING. Chapter four is an explicit return to the dialogue with Heidegger, which surfaces the main aspects of the essential belonging together of the fundaments and origins of philosophy and history. The Appendix is an applied philosophical research related to the previous subjects which examines the interlacements of DEATH and SECRET in the phenomenon of TERRORISM. The book is illustrated by the romanian artist: Teodora COSMAN. “HAD-BEEN-NESS” AND PAST ­­­– History and memory. Excursus nr.2: On the "NEVER"